Ah, Evening in Paris. 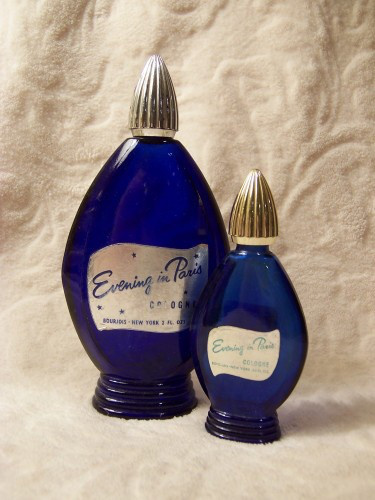 When I was in grade school, my mom and dad traveled to Paris so when I saw this bottle in a drugstore window, I thought it was the perfect gift. I can still remember buying it and being so excited because mom loved being in Paris. There have been many Mother’s Days since then, but no more of the perfume for a gift. Something much more exciting is in store for this Mother’s Day. 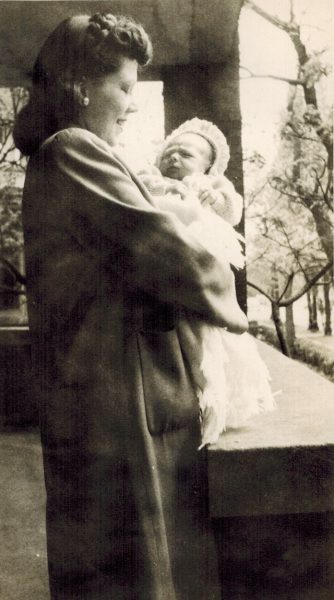 This was taken at a baby shower for daughter Kara, and below is when baby Virginia Rose and her great-grandmother met for the first time. 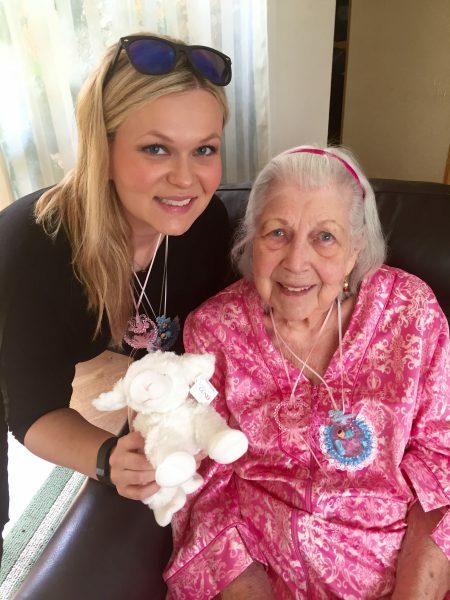 This Mother’s Day, I am so happy to announce that my mom will be a great-grandmother once again and Virginia Rose will have a new brother or sister! I can’t imagine a better Mother’s Day than with the knowledge that another baby is coming later in the year. It warms my heart to think my mom will be holding another great-grandchild. 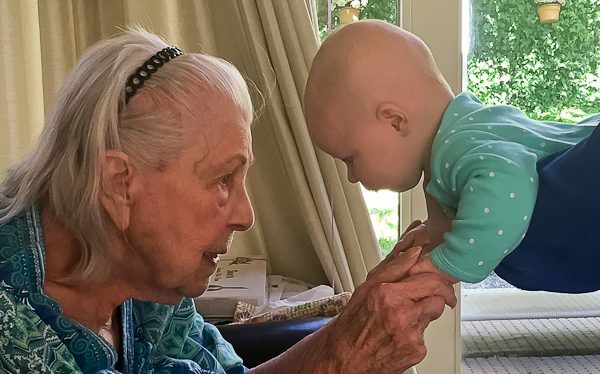 Virginia Rose and her sibling are so lucky to have a great-grandmother who can hold them at age ninety-seven. Not a lot of people can claim that. As they grow up they will feel her strength of character, giving nature, and a glow in her eyes that shows her loving spirit, and is now a part of them. Happy Mother’s Day, mom. It will be a good year because you are here, surrounded by all who love you. Congrats to Kara ! What a nice Mother’s Day message. Happy Mother’s Day to you also ! Thanks, Barb! Happy Mother’s Day to you too! Wonderful news! Congratulations to Kara and Robert. And to you and your mom, too. I used to give my mom Evening in Paris for Mother’s Day. I thought it was such a fancy gift back then. Isn’t it funny how so many kids thought Evening in Paris was the best Mother’s Day gift? I think the bottle seemed so fancy. I wonder if it is even on the market anymore? You are loved as well. Wish I could give you a hug back. Happy Mother’s Day, Leigh!! You are the best mom.